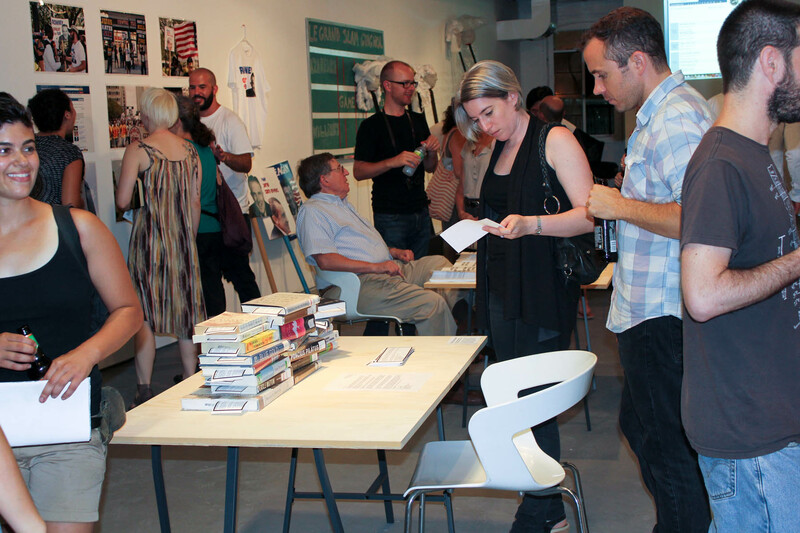 Flux Factory announces an open call for our 2013 exhibition season! Flux Factory exhibitions expand the creative experience beyond the typical gallery setting and result in the creation of newly commissioned work. Conceived as arenas of exchange, our exhibitions take artists outside the confines of their studios for direct engagement with the public, where together they use the Flux Gallery and urban space as sites for critical intervention. To apply for any of the exhibitions listed below, email exhibitions@fluxfactory.org with the exhibition title in the subject line and attach a single PDF (5MB or less) containing your project proposal, support sketches or images, examples of similar work, and your resumé or biography. See individual exhibition descriptions for deadlines and notifications. If you wish to apply for more than one exhibition, please send a separate email for each and make your application specific to the exhibition. Please visit some of our 2012 group exhibitions for reference: Banquet for America, iSpy, Public Trust, and Bionic Garden. THE SELECTION PROCESS IS CLOSED FOR THIS SHOW. This exhibition takes its point of departure from events that first appear to be catastrophic, but eventually open the door to new thoughts, practices, and opportunities. How do we react to large-scale events that we’ve never experienced before, such as a power outage throughout the eastern seaboard or a volcanic eruption that leaves hundreds of flights canceled and even more people stranded? What is it like to go outside of the parameters of a familiar system? Flux invites artists to create works in response to the breakdown of routine and displacement as a potentially fruitful phenomenon. Deadline for applications is no later than April 1, 2013 at 11:59pm; applicants will be notified of our decision on April 30, 2013. Curatorial Carte Blanche is a blank slate for one visiting collective to present an exhibition in line with Flux’s ethos of cultural enrichment through community-building. This could mean a group exhibition, installation, performance series, tour, a combination of these things, or any number of possibilities, as long as the project aptly fits Flux Factory’s mission for supporting the creation of experimental collaborative work. Deadline for applications is no later than May 1, 2013 at 11:59pm; applicants will be notified of our decision on May 31, 2013. Flux Factory invites artists and writers to collectively draft a story of an adventurer, and to physically create his or her fantastical collection of curiosities in the Flux Gallery. This exhibition will be an exploration of modern day myth-making and will include opportunities for the audience to influence the narrative. We are seeking artists of all disciplines to give form to our hero/ine’s adventures, constructing the cabinet itself to the works inside. Could one of the collaborators – artists or writers – be you? Deadline for applications is no later than January 15, 2013 at 11:59pm; applicants will be notified of our decision on February 1, 2013. Kitty City aims to re-imagine the urban planning process by partnering architects, city planners, artists and designers with elementary school students to design and construct a model for a humane and accessible city. Over a series of four weekend workshops, we’ll develop a visioning process, and collaboratively build our city. Once our city is constructed, we’ll flood it with kittens during a ribbon cutting ceremony and host an animal adoption drive. This is an experiment in pedagogy and inter-generational collaboration. We are looking for a diverse group of facilitators, makers, and cat-lovers for this development. We are also seeking enthusiastic students who would like to draw, design, and build. Deadline for applications is no later than February 1, 2013 at 11:59pm; applicants will be notified of our decision on February 28, 2013. Flux Factory’s 2013 Exhibitions program is supported in part by an award from the National Endowment for the Arts, and by the New York City Department of Cultural Affairs in partnership with the City Council and the New York State Council on the Arts with the support of Governor Andrew Cuomo and the New York State Legislature. Please join us on November 13th for our monthly potluck and art salon. Dinner starts at 8pm and artists presentations start at 9:30pm.